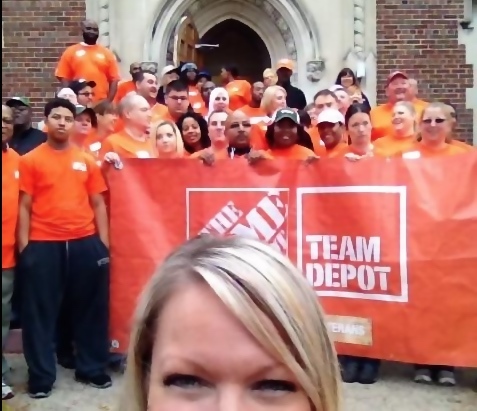 I'm so excited to partner with The Home Depot again this year for the 2-015 Celebration of Service! As part of Team Depot’s fifth annual Celebration of Service campaign, Team Depot - our associate-led volunteer force will spend the next two months (between 9/10 and Veterans Day) working on transformational safety and accessibility upgrades to restore independence for our nation’s veterans – especially senior veterans and those with severe service-connected disabilities. 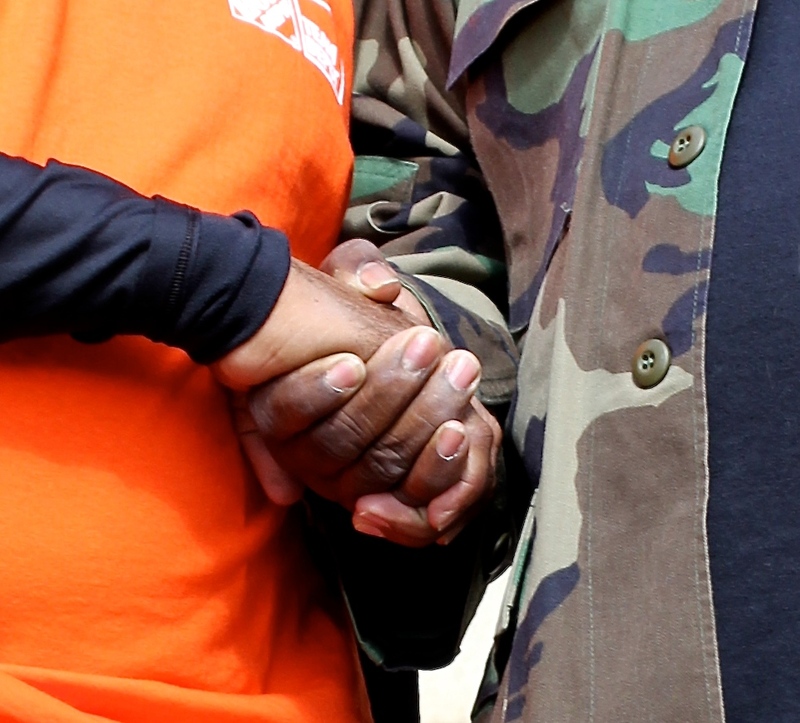 We invite you to join us in our efforts to help and show us how you celebrate service. Share a photo of yourself giving back in your community or honoring a service man or woman on Twitter or Instagram and use the hashtag #ServiceSelfie. 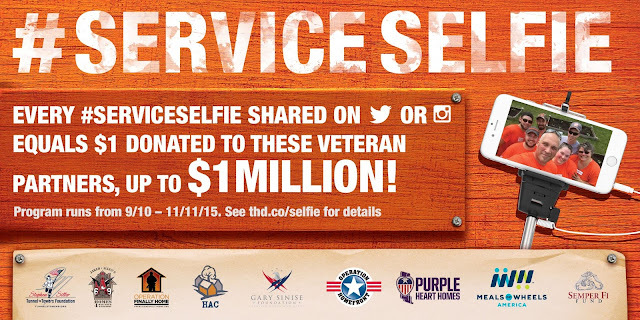 For each #ServiceSelfie shared during Celebration of Service, Team Depot will donate $1, up to $1 million, to nonprofits that help veterans in need. 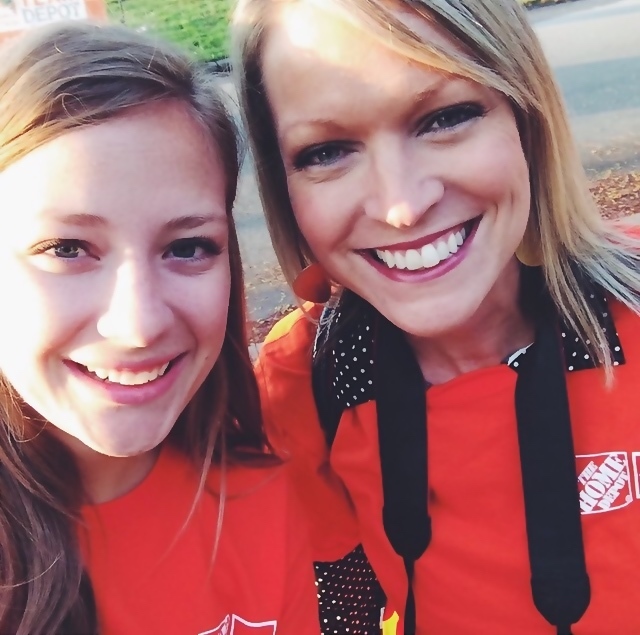 Follow Team Depot on Facebook, Twitter and Instagram. To match the magnitude of this mission, we're kicking off Celebration of Service in a big way-with three days dedicated to serving veterans. During the first weekend, 1,000 volunteers will be on the ground in more than 25 cities to improve safety and accessibility for more than 100 veterans. I'm looking forward to joining them and sharpening my service selfie skills...stay tuned for lots more as I work alongside Team Depot as part of the 2015 Celebration of Service right here in the Detroit Area! More details on that to come soon! I acknowledge that The Home Depot Foundation is partnering with me to participate in this Celebration of Service program (the “Program”). As a part of the Program, I am receiving compensation for the purpose of promoting The Home Depot Foundation and its non-profit partners. All expressed opinions and experiences are my own words. My post complies with the Word Of Mouth Marketing Association (WOMMA) Ethics Code and applicable Federal Trade Commission guidelines.